What Does Depression Have to do With Alcohol Abuse? Depression often presents itself in alcoholics, and at times is the main trigger for someone to start abusing alcohol. Both depression and alcoholism affect people from many different cultures, socio-economic backgrounds and age groups. Neither condition discriminates much when it comes to their victims, and therefore it is important that both be treated when an individual is considering rehab. Depression on it’s own is a very serious mental health issue, but it is often misdiagnosed, not diagnosed at all or left untreated even if a diagnosis is made. It isn’t something that “gets better with time” nor does it go away on it’s own like a stuffy nose or a bruised knee. It requires treatment with therapy and medication, either on their own are nowhere near as effective as they are when combined. 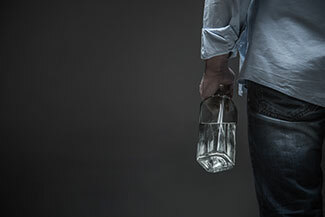 Alcohol is too often used as a form of self-medication by those suffering from depression. Sometimes an individual does not understand why they feel the way they do, don’t agree with their doctor’s opinion, or have found that antidepressants have not had the desired effect. The all-too-common solution to this is to drink. At first, alcohol may alleviate some of the nastier symptoms of depression, but this feeling is both not very genuine and more importantly, fleeting. Alcohol is a depressant substance. It slows down someone’s nervous system and relaxes them, certainly, but it does not improve mood in the short term or long term, and depression is considered a “mood disorder” under the larger umbrella of mental illness. Someone seeking to change their life by participating in a rehab program, primarily to treat their alcohol addiction, should be encouraged and supported in doing so. That being said, when someone enters a treatment program they must disclose that they are depressed so that both the alcoholism and depression can be treated simultaneously. Someone who is depressed and addicted to alcohol have a higher chance of relapse and suicide after treatment, which means their treatment plan needs to be tailored specifically to them and will require medical supervision and specialist care throughout rehab. Many treatment facilities do not offer this level of care, but it is important that any individual suffering from both alcoholism and depression seek out a program or residential rehab facility that offers this type of care.